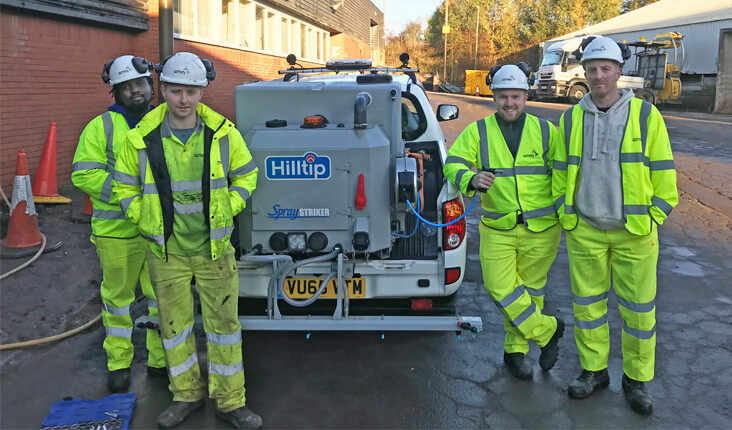 In May 2018, The Highways Magazine (https://www.highwaysmagazine.co.uk/) wrote a case study-article about the use of Hilltip SprayStriker™ on cykleways and footpaths. Peacock Salt’s Paddy Hastie, a member of the National Winter Service Research Group‘s (NWSRG) technical advisory group, gives a detailed case study on ice control for cycle paths. A large network of cycleways, footways and footpaths has been developed across the country alongside new and existing road infrastructure and it is important that the risks to users of this network are appropriately considered by those responsible for maintaining the infrastructure throughout the year. It is for this reason that the NWSRG’s new guidance will devote a whole chapter to this important part of our national infrastructure. So, how does one go about providing a winter service on large lengths of cycleways and footpaths that can be difficult to access via conventional winter maintenance vehicles? This is a challenge that Amey was presented with ahead of the winter 2017/18 season. In 2017 all new roads that were part of the Transport Scotland commissioned M8, M73, M74 Motorway Improvements Project opened. As operation and maintenance contractor for the project, Amey, on behalf of Scottish Roads Partnership, has a maintenance responsibility for over 20km of 3-6-metre wide footpaths and access tracks adjacent to the A8/M8 between Baillieston and Eurocentral and the A725/M74 around Raith Interchange. The typical Scottish winter presented challenges to the team. Many of the pathways have infrequent use. Traffic helps the activation of traditional granular de-icers. For all areas of footpaths the use of sodium chloride brine was stipulated. After analysing the routes, the decision was made to also treat some of the low trafficked access tracks with brine at the recommended application rate of 30ml/m² as the de-icing properties of brine activate more quickly than granular de-icers and without the same requirement for frequent traffic of the pathways. Various criteria are utilised to trigger winter treatment, typically a predicted minimum road surface temperature of PS1.0 (+1°C) or below, or a forecast winter hazard, and sometimes it is necessary to mobilise and undertake action at short notice. With constant pressure on resources, and the planned future handover of some of these paths to adjacent local authorities, utilising existing vehicles available for the contract was a desired approach. In line with the requirements for other de-icing vehicles, there was also a desire to ensure that sufficient data was recorded to evidence the treatments being carried out and that reports would be available documenting such treatments. Although this is not generally a problem for the larger carriageway gritting vehicles that are equipped with vehiclemounted data loggers, much of the traditional spraying technology for footpaths and cycleways is basic and largely based around equipment originally designed for agricultural use; it typically has minimal data logging ability and no tracking facility. Amey’s existing M8, M73, M74 project fleet has two Mistubushi L200 pickup trucks available for use during the winter season. Peacock Salt, an NWSRG member, demonstrated the Hilltip SprayStriker™ to Amey. 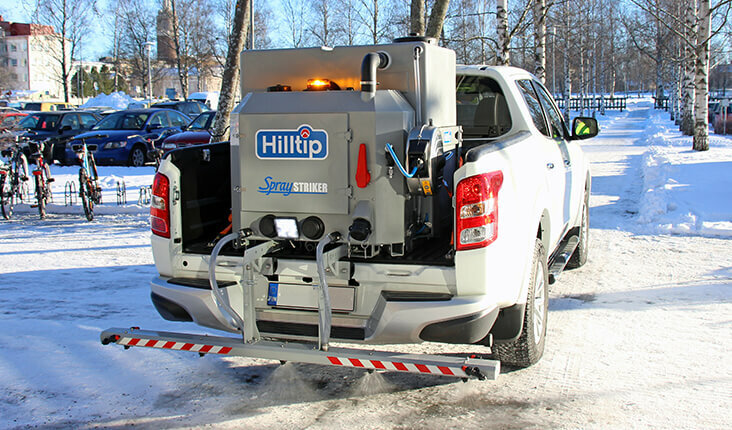 Hilltip is a winter service equipment manufacturer based in Finland and the SprayStriker™ is a liquid sprayer which can be quickly mounted and de-mounted to a vehicle once the connections have been built onto the vehicle. Due to weight restrictions of the pickup trucks, a 500-litre capacity was required. The Hilltip technology seemed a perfect fit for their needs. No equipment is ever one-size-fits-all and the team optimised the SprayStriker™ unit for their needs. The SprayStriker™ pump system has been calibrated to optimise it for the specific liquid density of the brine, produced in an on-site saturator. A 12-metre hose reel and nozzle was installed, which enabled harder to reach areas to be treated without the need to overmanoeuvre the vehicle. Manual sprayers were also supplied by Peacock Salt for areas such as footbridges requiring less corrosive de-icers. The unit uses a GPS antenna to determine ground speed and can control unit pumps as appropriate. The winter service operative sets an application rate in ml/m² and then has the assurance that the set spray rate is met, regardless of vehicle speed. In use, operatives also found that using the ‘automatic’ setting mitigated the risk of spraying other path users, and that all they had to do was stop the vehicle and resume treatment when the pedestrian or cyclist has passed. The GPS antenna alerts the pumps when the vehicle has stopped so the treatment programme is paused until the vehicle moves again. 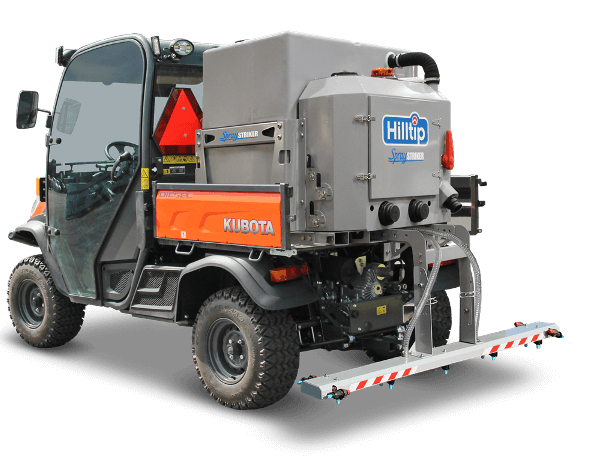 Hilltip also created a service called HTrack™, which allows their salt spreaders and ploughs to be tracked and the data sent to a server. Users log on and can extract reports on salt usage, treated locations, spread width and application rate. It provides evidence of treatment to end-users in order to assist them in demonstrating that their duty of care has been met. With a few software changes, HTrack™ was updated to enable liquid de-icer tracking. The HTrack™ tracking functionality gives the management team the required timestamped data in an easy to understand format, clearly stating application rates, when the vehicle is spraying or travelling, spray widths and treatment volume. * Putting the Icestriker into manual mode when driving off will also prevent any lag time.